British Library, MS Harley 978, is a manuscript from Reading Abbey dating from the mid-thirteenth century. Reading Abbey, however, did not have a scriptorium, and the MS was probably copied at Oxford, which as a university town was a major centre of book production by this period. It was probably owned by one of the three Reading monks it mentions, William of Winchester, a lover of music whose history was otherwise undistinguished and occasionally scandalous; on a visit to Leominster Priory in the 1270s, he was brought before the Bishop of Hereford for incontinence with a number of women, including a nun of Limebrook Priory. The manuscript is a miscellaneous compilation, mainly of Latin and French texts, useful or entertaining rather than devotional; it includes other musical pieces (all religious), medical material, Goliardic satires, the earliest and best text of the Lais of Marie de France, and a French poem on hawking. 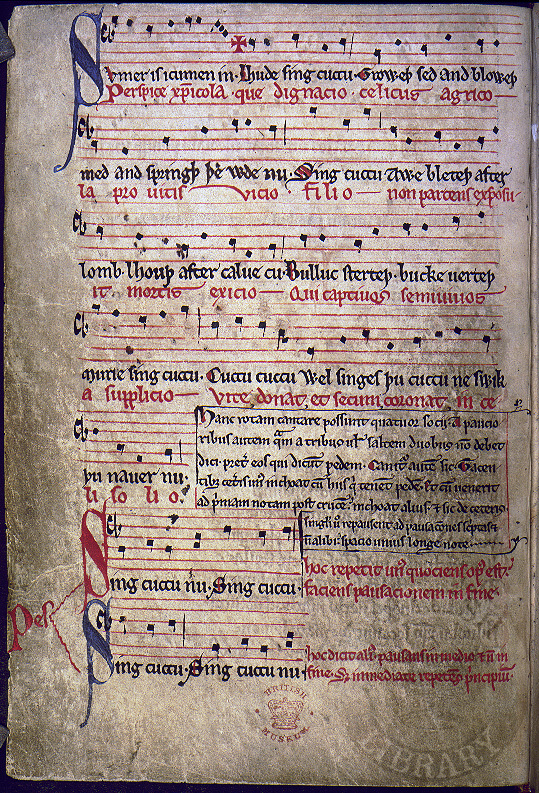 Sumer is icumen in is the only Middle English text in the manuscript, and it is possible that it was included primarily for its musical interest. See Booklist for further reading. Go to the new British Library (nearest Tube: King's Cross / St Pancras), and up the main stairway to the John Ritblat Gallery. Turn left as you go through the door; and you will see Harley MS 978, open at Sumer is icumen in, in a display case in the corner. Put on the nearby earphones, press the appropriate button, listen to the Hilliard ensemble (Harmonia Mundi, HMC 901 154 (1985)) singing the tune, and sing along with them (you may be thrown out for this, of course. Don't get too carried away). Set up by Bella Millett, enm@soton.ac.uk. Last updated 28 April 2004 . Reproduction of London, British Library, Harley MS 978, f. 11v, by permission of the British Library; no further reproduction permitted.